Newsletter just winged its way out into the ether - sign up for occasional exhibition and other news! New installation, Graft, at PS Mirabel in Manchester, a show with Rowan Eastwood. All welcome to preview Thurs 23 February 2017, then open Saturdays 11-5 and by appointment (with me) to 1 April. In addition there is an opportunity to meet the artists on the closing day, Sat 1 April, with both artists in the gallery 11-5. Graft is an exhibition at PS Mirabel, Manchester of new work from artists Holly Rowan Hesson and Rowan Eastwood exploring and expanding their shared interests in materials, intuitive process and responding to site. Hesson’s work explores the gap between and interplay within purely sensory feeling and more literal, rational thought-based experience and an interest in the validity of uncertainty when approaching, experiencing and decoding the visual. Her work is concerned with the actual fragility and transience of what seems solid, weighty and permanent, both physically and also in the way things are perceived. Through intuitive and process-led image making, she creates dialogues with material, sites and residual memories. This interrogation regularly starts from abstract photographs made in situ capturing an interest in specific man-made structures, buildings and physical spaces. Using the visual language and formal concerns of abstraction, her resulting sculptural and installation work is multi-layered with uncertain depth of focus. Eastwood’s work focuses on minor alterations and installations in everyday environments. By working with various materials she explores different situations and creates responses that feel playful, instinctive and inherent. Works develop and progress over time, with external influences often having an effect on a piece; time, movement, natural elements and human interactions allow the piece to evolve with little influence from the artist. Encouraging these interactions, her intention is to leave familiar and accessible works that the viewer can engage with on a relatable level. When working in a situation or place she intends to grasp the viewer's attention through small, subtle adjustments which are crafted with a fundamentally lighthearted and impulsive approach. The final outcome can either be viewed as documentation of a prior process, or a piece which may evolve with its exhibition. All welcome to the preview of Graft at PS Mirabel, Manchester city centre on Thursday 23 February 6-9pm. Then open Saturdays 11-5pm from 25 February to 1 April. Holly Rowan Hesson received an MA in Contemporary Fine Art with Distinction from Salford University in 2013. Recent solo exhibitions in 2016 include New Work at & Model, Leeds and Assembly at Bankley Gallery, Manchester which was awarded after winning the Bankley Gallery Open in 2014 selected by Kwong Lee, Castlefield Gallery, Kate Jesson, Manchester Art Gallery, Chris Bloor, & Model and Peter Seal, artist. In 2015 Hesson was selected as part of Castlefield Gallery’s presentation at The Manchester Contemporary. Hesson has exhibited in solo and group shows nationally over the last four years. Holly Rowan Hesson is currently supported using public funding by the National Lottery through Arts Council England. Rowan Eastwood graduated from Leeds Beckett University with a Fine Art degree in 2013 and is now based in Manchester. Eastwood helped set up Depot Art Studios in 2015 where she holds a studio. Regularly exhibiting across Manchester, Eastwood was recently selected for the Might & Main residency at The Penthouse and was awarded second prize in PS Mirabel's Spectrum open exhibition. PS Mirabel is an artist run project and exhibition space in the centre of Manchester. Open every Saturday 11am to 5pm and by appointment. PS Mirabel, Mirabel Studios, 14/20 Mirabel Street, Manchester, M3 1PJ. New work being shown at Ruskin Gallery, Cambridge. Preview 26 January 2017 and open to 18 February. Delighted to have received an Arts Council England Grants for the arts award for research and development starting later this month. More news to follow. My A-n Professional Development bursary is currently funding a series of curatorial critique sessions focusing on the work made for my two solo shows of the first part of this year with invited curators across the country. So far I've had inspiring meetings with Bryony Bond from The Tetley in Leeds, Anneka French, independent curator based in Birmingham, Paulette Terry Brien at International 3 in Manchester, Adam Smythe at The Bluecoat in Liverpool and Fiona Corridan and Kate Jesson from Manchester Art Gallery. The bursary will conclude with a session with Louise Hutchinson at S1 in Sheffield in October 2016. Delighted that my work Harness is in the current PS Mirabel open show, Spectrum, in Manchester. The PS Mirabel Open 2016 was selected by Mark Doyle (Touchstones Gallery Curator and Collections Manager), Lisa Denyer (Artist and 2015 Winner), Magnus Quaife (Artist and Lecturer at MMU) and Robert Miller (Contemporary Art Collector) and I was happy to receive a commendation from the judges. The show runs until 13 August 2016, open every Saturday 11am to 5pm and by appointment. PS Mirabel is an artist run project and exhibition space in the centre of Manchester. Delighted with this new essay on my work from Derek Horton. Contemporary visual culture offers an unprecedented amount of visual information through the ubiquity of cameras, particularly in mobile phones, and the capacity for the immediate publishing and rapid circulation of photographic images through social media. As technology improves and access to it widens, more and more aspects of the world are recorded and seen. Technological advances strive for greater clarity and resolution, but imagery that counteracts such perfection with blur, visual noise, shaky cameras and non-transparent filters is ever more popular. Whilst transparently high fidelity pictures dominate our experience there is, paradoxically, a growing interest in more enigmatic images that render our relation to what is represented precarious. The accidents of recording take on a life of their own as they become just another part of our saturated visual surroundings, developing as a genre with its own niche place within our visual culture. Creating a strong affective impact through making art involves finding ways to avoid simply copying physical reality and, where photography is concerned, leaving behind unquestionable accuracy in favour of distortion by means of processes such as pixelation, superimposition and filtering. As the uses of photography increasingly infiltrate contemporary art, blurriness, opacity, and indeterminacy have emerged amongst a multiplicity of low definition strategies across a diverse body of artistic practices, both analogue and digital, that invite us to see the world, but through a lens that obstructs and complicates our vision. Ludwig Wittgenstein, Philosophical Investigations, §71, 1953. Increasingly, it could be argued, an aesthetics of precariousness is being played out in current art production. A dialectic between transparency and opacity—literally and metaphorically—lies at the heart of this precarious aesthetic, articulated formally through images that are not themselves fully based on directly recorded material, but manipulate such material, operating at the mercy of bodies and technologies that are unstable and liable to fail. This is the territory in which Holly Rowan Hesson’s art practice is situated. Hesson makes abstract works that derive primarily from the photographic capture of colour, surface, shadow and light within the built environment. They emphasise the fragility, transience and ambiguities of what may initially appear solid, weighty and permanent. 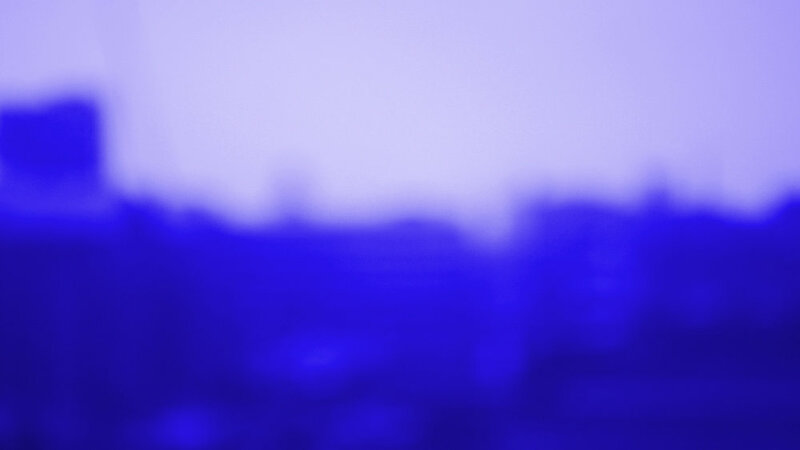 Blurred uncertainty disrupts the reading of the colour and complex surface of her work, whether in projections, prints, sculptural objects or ephemeral installations. Hesson’s use of photography and its central though not always obvious role in her practice often relate to a specific and somewhat esoteric term in photography, ‘bokeh’. The term comes from the Japanese word boke, which means "blur" or "haze", or boke-aji, the "quality of blurring". (The Japanese term boke is also used in the sense of a mental haze or senility, and the related term bokashi refers to intentional blurring or gradation.) Bokeh is the aesthetic quality of the blur in the out-of-focus parts of an image that lie outside the depth of field of the lens, referring to the way photographers sometimes deliberately use a shallow focus to create images with prominent out-of-focus areas. Although always seen as fundamentally a recording medium and dominant in our means of documenting the world around us, since its very beginning photography has also revealed the spectral, recording the stream of light passing through the lens but depicting ethereal images that could never have existed without the intervention of the camera. The early development of photography was grounded in the 19th century’s desire to record, quantify and analyse, but the limitations and flaws or mistakes of photographic technique were quickly absorbed and adopted by photographers with an eye for the creative potential of their medium. Double exposure, accidental fogging of the film or paper, using the wrong chemicals, getting things too hot or too cold, lengthy exposure, blurred focus—all of these have been exploited to produce visual effects that take photography away from the everyday and place it somewhere else, creating an alternate reality to the purely optical, emphasising an awareness of the transience of sensory perceptions. Hesson, although mostly using a digital camera, works in the tradition of these creative manipulations of ‘proper’ photographic technique. The images Hesson makes, often blurred or bathed in a bleaching light or rich with intensely saturated colour, are produced by her manipulation of the camera when shooting them rather than through any digital post-production. The post-production that takes place lies in the manual activity of overlaying, assembling and layering; in the material processes of printing on various materials; and in re-photographing and multiple projections that add further layers of imagery. 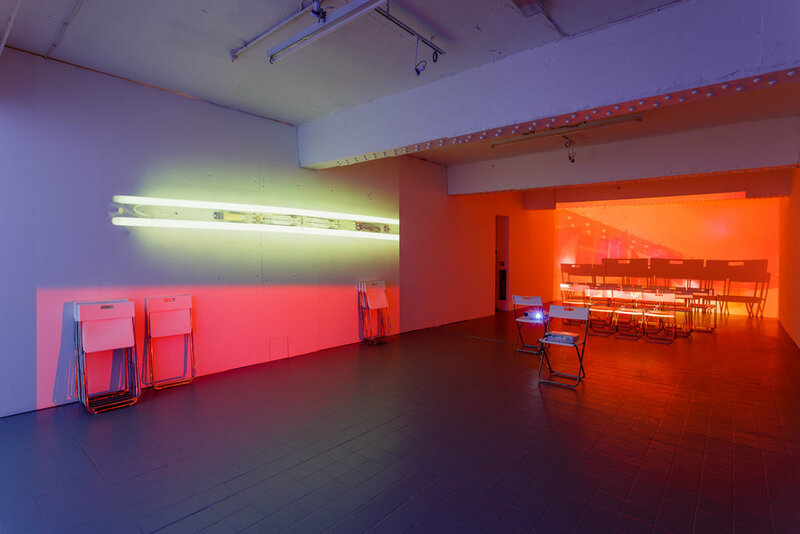 Hesson’s residency at &Model Gallery, Leeds, in January 2016 provided the opportunity for an intensive exploration of its surfaces and spaces during which she took hundreds of photographs. These photographs formed the basis of a new body of work installed in &Model’s various rooms in ways that merged with or accentuated elements of the architecture of the building rather than being imposed upon it. These works resist the realm of visual ‘truthfulness’ that has come to be associated with photography and aspire to a quality of otherworldliness that gives shape to the ephemeral. Architecture melts into light and air, or takes on the blurred split-second of vision when you wake in the morning unaccustomed to the brightness and straining to focus. The shifting images revealed in this work are tangible yet uncanny, familiar enough to be recognisable but somehow as a dream image that doesn’t ‘look’ like a room, but rather ‘feels’ like a room, or perhaps even a memory of a room. Using photography to summon an ethereal presence, Hesson’s works no longer seem to represent something as if seen through a lens, but rather as if remembered, or only half-remembered—they have a viscous quality as if the viewer must struggle to grasp the image from a blurred confusion that seems to drift between the abstract and representational in a fluid way. This dialectic of representation and abstraction, mapping onto the dialectic of transparency and opacity referred to earlier, is central to the way in which, unlike the purely formalist works they might be thought to resemble, these works are replete with content. Hesson's practice extends considerably beyond the photographic. Even when she is working with photographs they are printed on a diversity of supports and surfaces, various papers, fabrics, glass and acetate or other plastics, or projected onto objects and materials in the architectural settings of her site-specific installations. The work resonates with the tension of material and image and collapses material hierarchies, using highly finished industrial materials alongside abject detritus, in a process that fuses carefully thought-out planning with intuitively improvised action. Combining a highly formal approach to abstraction with more craft-based methods of image-making to explore colour, shape, and texture, the work acknowledges and draws on histories of photography and textile arts, and finds connections with the Colour Field painters of the 1960s and 1970s. Hesson is interested in investigating the effects of colour and light on interior space and visual perception. Light sources, light-reflecting objects and the shadows they create constantly shift and change in her installations which, ephemeral, seductive, and chameleon-like, fluctuate between a luminous stillness and a serene temporality, never quite the same at any one time, or from any one perspective. Extending the idea she had earlier explored at &Model—photographing and re-photographing a space to literally re-present it within itself—in March 2016 Hesson constructed another installation at Bankley Gallery in Levenshulme, Manchester that took this strategy to another level of sophistication. With the title, Assembly, utilising only a large quantity of identical folding chairs and three projectors in the empty gallery space, it was deceptively simple and yet provided a complex sensory experience replete with a visual and metaphorical layering of images, ideas and references. Mundane industrial architecture was transformed by being bathed in colour and made complex by the repetition of its features and surfaces as projected images alongside, opposite or superimposed over their material originals. Mass-produced chairs in massed ranks functioned both as readymade and multiple sculpture—with all the sly art historical innuendo that implies—and as screens, further fracturing and disrupting the architecture of the space and its light-intensified multiplication through photographic projection. There is a kind of alchemy in the conjuring of such an intense experience out of such unpromising materials, the everyday contingencies of very ordinary surroundings rendered extraordinary by a precarious balance of aesthetic sensibility, meticulous thought and improvisational experiment. Derek Horton is an artist-writer and curator. He writes about art and as art. After working on adventure playgrounds and community arts projects in the 1970’s, he spent many years teaching undergraduate and postgraduate art students. He co-founded the online magazines ‘/seconds’ with Peter Lewis in 2005 and ‘Soanyway’ with Lisa Stansbie in 2009. He is now co-director of &Model, an international contemporary art gallery in Leeds, and Visiting Professor of Contemporary Art at the School of Art, Birmingham City University. I'm busy documenting and reflecting on my two recent 2016 solo shows Assembly at Bankley Gallery and New work at &Model with thanks for the photographs from professional photographer Jules Lister. The closing of my solo show, Assembly, in April 2016 represents the conclusion of a year-long Arts Council England Grants for the arts research and development award and I'll soon be evaluating the year. In addition I'm delighted to have received an A-n Professional Development Bursary and an award from Oppenheim-John Downes Memorial Trust which will allow me to reflect and build on the developments I've made over the past twelve months including lots of visits with curators to talk about my work. Assembly is a new immersive installation by Holly Rowan Hesson at Bankley Gallery in Levenshulme, Manchester. Preview Friday 18 March 2016 6-8pm, all welcome, then continues Sat 19 March, Sat 26 March and Sat 2 April 12-4pm. "Holly Rowan Hesson makes abstract works that derive from the photographic capture of colour, surface, shadow and light in specific architectural and man-made locations. They emphasise the fragility, transience and ambiguities of what may initially appear solid, weighty and permanent. Blurred uncertainty disrupts the reading of the rich colour and complex surface of her projections, prints and ephemeral installations. This solo show at Bankley Gallery is as a result of winning the 2014 Bankley Gallery Open Call and forms the conclusion of a year-long Arts Council England Grants for the arts research and development award. This installation will be the first show in Bankley Gallery's newly refurbished gallery space, which is just five minutes by train from Manchester Piccadilly. Supported using public funding by the National Lottery through Arts Council England. Specific support towards this exhibition also from Matthew Pendergast and Lisa Denyer. 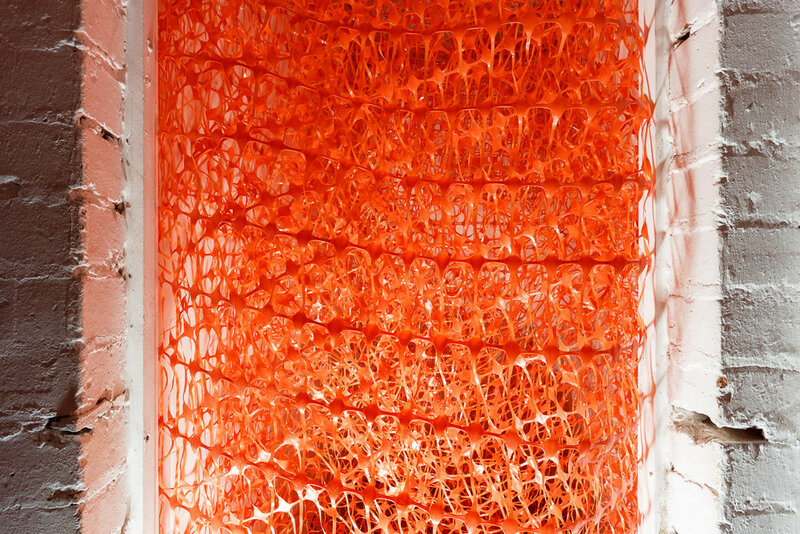 Holly Rowan Hesson has been making new work during a four week residency at &Model. On the upper floors of the gallery she will be showing the outcomes in an installation combining photography, print, projection and sculpture. Holly Rowan Hesson makes abstract works that derive from the photographic capture of colour, surface, shadow and light in specific architectural locations. They emphasise the fragility, transience and ambiguities of what may initially appear solid, weighty and permanent. Blurred uncertainty disrupts the reading of the rich colour and complex surface of her projections, prints and ephemeral installations. Hesson’s residency at &Model over recent weeks has allowed her to make an intensive exploration of its surfaces and spaces during which she took hundreds of photographs. These photographs form the basis of all the new works in her current exhibition which is installed in ways that merge with or accentuate elements of the architecture of our building rather than being imposed upon it. The images Hesson makes, often blurred or bathed in a bleaching light or rich with intensely saturated colour, are produced by her manipulation of the camera when shooting them rather than through any digital post-production. The post-production that take place lies in the manual activity of overlaying and layering, physically or through projection, or in the material processes of printing on various materials that are sometimes themselves re-photographed. These works resist the realm of visual ‘truthfulness’ that has come to be associated with photography and aspire to a quality of otherworldliness that gives shape to the ephemeral. Architecture melts into light and air, or takes on the blurred split-second of vision when you wake in the morning unaccustomed to the brightness and straining to focus. The shifting images revealed in this work are tangible yet uncanny, familiar enough to be recognisable but somehow as a dream image that doesn’t ‘look’ like a room, rather it ‘feels’ like a room, or perhaps even a memory of a room. Seven Turns: Meditations on a Coffee Mill, curated by Keith Bowler and Peter Suchin, presents work by Wolfgang Berkowski, Keith Bowler, Peter Fillingham, Simon Patterson, James Rogers, Peter Suchin and Julian Wakelin, in response to Marcel Duchamp's painting, The Coffee Mill, 1911. All welcome at the preview, free bar, the artists and curators will be present. After this the exhibition will remain open Wednesdays to Saturdays 2pm-5pm until 5th March 2016. Many thanks to Castlefield Gallery for selecting my work alongside five other artists to show at The Manchester Contemporary last month, a fantastic experience. The Manchester Contemporary opens this Thursday 24 September 2015 and I'll be showing new work with Castlefield Gallery. Thanks to a-n for using my work in their article about Castlefield Gallery at The Manchester Contemporary. And thanks to Axisweb for inclusion in their #Five2Watch at The Manchester Contemporary pt. 2 feature. Looking forward to being part of the judging team for this year’s Bankley Open Call as the winner of last year's prize with Spark. The Open Call exhibition opens Friday 9 October 2015. Many thanks to Castlefield Gallery and Creative Industries Trafford (CIT) for awarding me mentoring support following a portfolio surgery session as part of their support to contemporary artists. Also thanks for the nomination to my portfolio reviewer Derek Horton, Co-director at & Model, who has since agreed to be my 2015 Arts Council England Grants for the arts award mentor. Thanks to Axisweb for making me their Artist of the Month for August 2015! All invited to the preview of Tracing PAPER featuring new work by myself and eight other artists at PAPER Gallery in Manchester this Thursday 4 June 2015. Visiting the Manchester Art Gallery art stores as part of my Arts Council England funded research and development project for 2015. Hundreds of photographs taken as the basis for making new work. Join us for OPEN HOUSE on Thursday 26 March 6-9pm at CG New Art Spaces Federation House, currently CG’s flagship New Art Space in city centre Manchester. Exhibitions, open studios, film / video, and performance over eight floors. CG New Art Spaces Federation House is made possible through the support of NOMA. Delighted to find out from Arts Council England that my Grants for the arts application has been successful. Generator runs through 2015 focusing on practice research and development resulting in a body of new work and including a solo show in early 2016. Showing my work Burst in a pop-up show Glitter + Gold at Cardroom, Rogue Studios in Manchester. The show opens on Saturday 13 December 2014, 6-9pm and continues to Sunday 14th. 12-4pm, all welcome.